Condolences to Jonathan on the death of his friend. I haven’t really felt like blogging for a while. I needed some time to unwind. Didn’t we all? And now we’re all trudging back to school. No, not trudging — skipping! Merrily! Fall semester always has a funny rhythm to it. Thanksgiving comes so close to the end it effectively lops off the last couple of weeks. Everyone is going through the motions in their classes, just trying to get done. It feels like the semester is already over, and that the last two weeks are just a technicality. And there’s nothing much you can do to convince your students otherwise. There’s a lot I felt thankful for this Thanksgiving. This was the most thankful Thanksgiving ever. I’m thankful for our wonderful neighbors, who cut down the dead tree between our houses and even cut it up for us for firewood. I was thankful for my new house, which is small but pretty and cozy and which I love, and I was thankful that we are no longer paying both its mortgage and the one on our old house in Texas. See, we *did* sell the Austin house back in May, but then the deal fell through 24 hours before closing, and then the national housing market went kablooie, and we were stuck with an extra house on our hands, with little hope of selling it. But we sold it shortly before thanksgiving. I was thankful for this. I was thankful for the blog, to be honest, because I’ve come to value it for making me a smarter, better, more productive scholar. A lot of people ask me how much time I spend on it, because it seems like an awful lot of work, and I guess it is, but I believe it actually makes me more productive in my non-blog-related writing. Writing these little feuilletons feels like playing scales or something — it warms up the writing part of the brain, it primes the pump, it keeps me in shape when I don’t have time to work on bigger things, and it helps me work out ideas that I didn’t know I had and which would otherwise languish unformed somewhere in the back of my mind. And, while I’m being thankful for this blog, I’m also thankful for our readership — the musicoloblogosphere and our commenters. Check out the comments threads on a larger site, like the Onion AV Club blog, and you can kind of see why so many people think blogs are evil. Why are Dial M readers not like this? Probably we’re too small-time to be hated on, but still, one of the reasons blogging can keep the mental pot on the boil is that, ideally, you get people reading who will say stuff to you that you don’t see coming and that forces you to think in institutionally non-prescribed ways. I guess I’ve said this before, but it’s worth repeating. I’m also thankful that there are a couple of new musicology blogs added to the blogroll. Go check them out. OK, I guess that’s enough gratitude for one post. 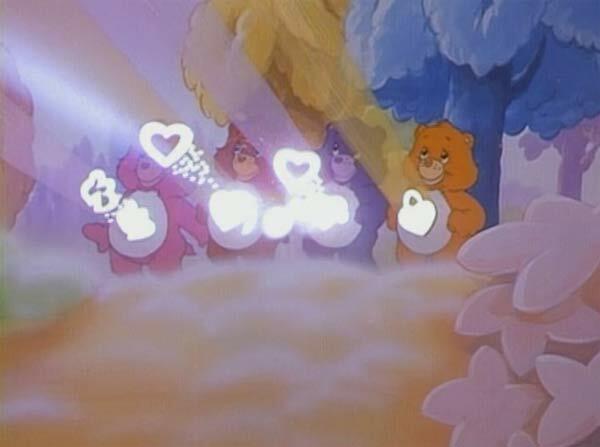 On a totally unrelated note, I would like to propagate a blog meme: the care bear stare. Julian Sanchez, who has demonstrated his connoisseurship of cheap 1980s animated kids shows before, recalls that the Care Bear Stare “was a sort of deus ex machina the magical furballs could employ when faced with some insuperable obstacle: They’d line up together and emit a glowing manifestation of their boundless caring, which seemed capable of solving just about any problem.” Julian goes on to note that the political left and right each has its own version of the Care Bear Stare: for the neocon right, it’s the notion that “the American military can produce just about any effect imaginable if only the Will of the American People is strong enough. When any foreign intervention fails, this is proof that our will was insufficient, presumably due to the malign influence of fifth columnists in the media.” For the left, it’s that “we know perfectly well how to solve problem X, if only we cared enough or had the political will to address it.” What is the musicological version of the Care Bear Stare? Perhaps it’s something Jonathan has identified in his post on Richard Taruskin’s big TNR piece — when we’re faced with massive public lack of interest in the Relatively Unpopular Music we teach, our response is always “keep listening!” As Jonathan notes, this only works if you’re already listening. Musicologists are good at telling people how to listen in new ways, but not so good at getting people started in the habit.